After the first use of the Geo-CoolerTM in 1977, Elwood’s mud coolers were used throughout the rest of the 70’s and 80’s for geothermal projects in California. The engineers and company men involved in these geothermal wells later became the HTHP oil and gas drillers of the early 90s. 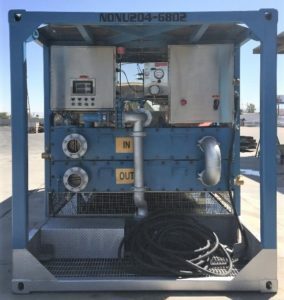 Due to their experience with the Geo-CoolerTM, they requested for Elwood to ship his equipment to both onshore and offshore drilling rigs. By 1995, Geo-CoolersTM were shipped frequently outside California and even internationally. The demand for Geo-CoolersTM led to a new design, which could be cost effectively shipped to international customers. The demand for the Geo-CoolerTM grew with the HTHP community because it made the operation safe, but there were more benefits of the Geo-CoolerTM. 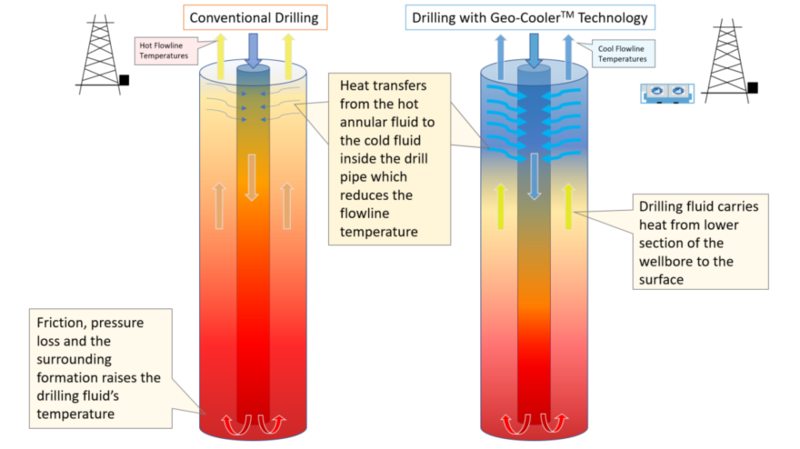 By reducing the surface temperature of drilling fluid, the Geo-CoolerTM provided a heat sink for the returning, hot annular fluid. In effect, annular fluid (flowline) did not flash or burn personnel as it entered the shakers. This cool annular fluid also reduced the temperature of the BOP and its internal components. Thus, the elastomeric packer elements were protected from high temperatures. When elastomers are heated to high temperatures, they begin to decompose and their mechanical properties deteriorate [1,2]. Extrusion and cracking of the packers are a result of this process , which can ultimately lead to a well control incident. Thus, surface temperature plays an important role in well control of HTHP operations. Parco, Elastomer Selection Guide. Ontario: Parco Inc., 2013, pp. 1-2. B.G. Parker, “Development of Geothermal Capable Elastomers for Use in Ram Type Blowout Preventers Phase IV Testing at Geothermal Wellsite,” Transactions, vol. 19,pp. 117-122, 1995.